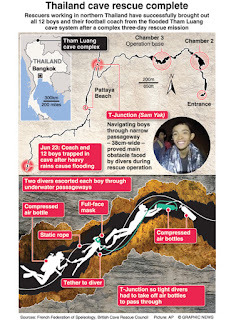 "THAILAND: All 12 boys and their soccer coach trapped for more than two weeks deep inside a flood Thai cave have been rescued, a Thai navy SEAL unit said on Tuesday, a successful end to a perilous mission that has gripped the world". “You have seen the rain so you might be wondering – preparation for the third operation has been under way since early morning,” said Narongsak Osatanakorn, the head of the joint command centre coordinating the operation. 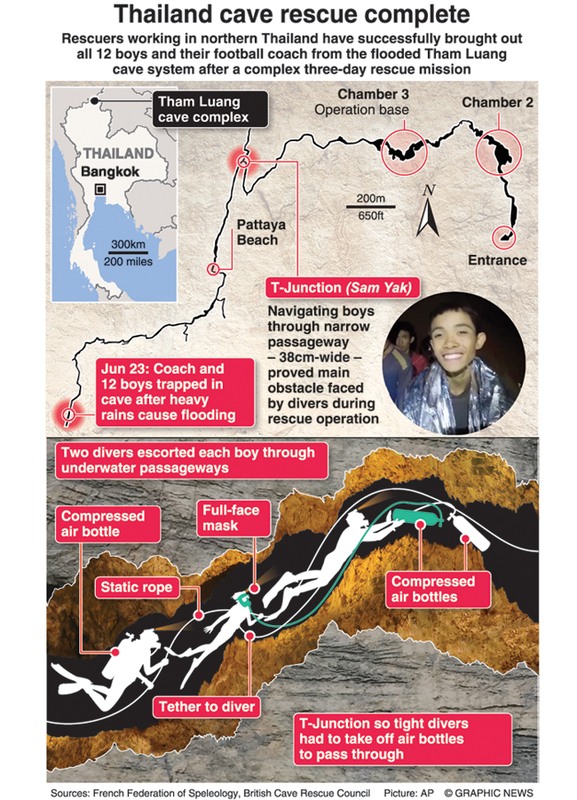 The perilous rescue had gripped the world but celebrations will be tinged with sadness over the loss of a former Thai navy diver who died on Friday while on a re-supply mission inside the cave. The first four boys to be freed were reunited with their parents on Monday night through a glass window. Public health officials would decide on Tuesday whether the second batch could see their families. He said they would need to keep at least 2 metres away from their boys for at least 48 hours, until “we are sure there is no infection, then they can visit them normally”. No boys would be discharged for at least seven days. Jesada Chokedamrongsuk, a physician from the Thai ministry of public health, told a separate press conference at the Chiang Rai hospital that the eight patients were cheerful. Two boys among the first group to be freed, who he said were aged between 14 and 16, had shown possible signs of pneumonia and all had low temperatures when they arrived on Monday night. The boys had asked for chocolate spread on bread, which the hospital had provided, he said. They were still wearing sunglasses as a precaution while their eyes adjusted to the light, he added. “For the second lot of patients arriving last night, whose ages range from 12 to 14, they arrived with very low body temperature, and one of them had a low heart rate,” he said. He said the second group of four boys would undergo detailed testing of their eyes, nutrition levels and mental health, with blood samples to be sent to Bangkok to test for any infectious diseases. “All of them have an increase in white cells in the blood, which indicates infections, so we have given them antibiotics as a precaution,” Chokedamrongsuk said. Overnight, the entrepreneur Elon Musk posted on social media that he had personally delivered a child-sized submarine to the site which he has developed to assist with the operation, but it is unlikely to play a role. “Although his technology is good and sophisticated, it’s not practical for this mission,” Osatanakorn said after the press conference. Osatanakorn announced the start of the latest rescue mission to applause and cheers in the local government courtyard that has become a centre for Thai volunteers and the world’s media. 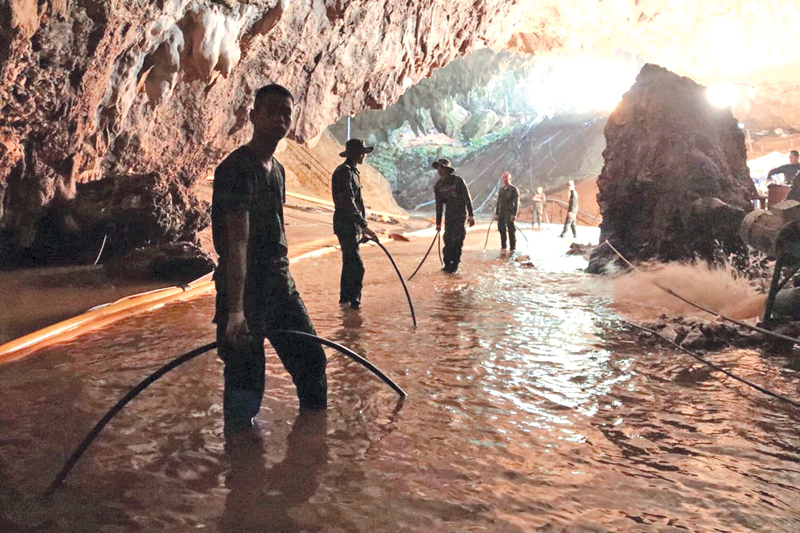 The mood was in stark contrast to the glum atmosphere at the site last week, especially after the announcement of the death on Friday of the former Thai navy Seal Saman Kunan, who died while placing air tanks in the cave.